Radiator overflow bottles can be made as an extension of the radiator or as a 64-76mm tube around 300-400mm long that runs down the side of the radiator with a cap and mounting brackets fitted for easy access. The expansion tank is a pressurised system which is tested to 30 psi. We fit expansion tanks with a radiator cap which is useful when the radiator is lower than the motor, making it difficult to fill or remove airlocks. Custom cold air boxes matched to your car’s style can really set it apart from others. At Radiators Plus, we’ve built a wide variety of cold air boxes over the years, from the over-the-radiator style for V8s to streamlined cold air induction systems for full race versions. We’re enthusiastic about all projects and welcome the opportunity to build you something special. If you’re after a more unique look for your 4WD than what you’ll find at an aftermarket automotive store, we can build custom aluminium and stainless steel snorkel for all 4WD makes and models. As with all our custom radiator parts and accessories, these are built in-house to your precise specifications. 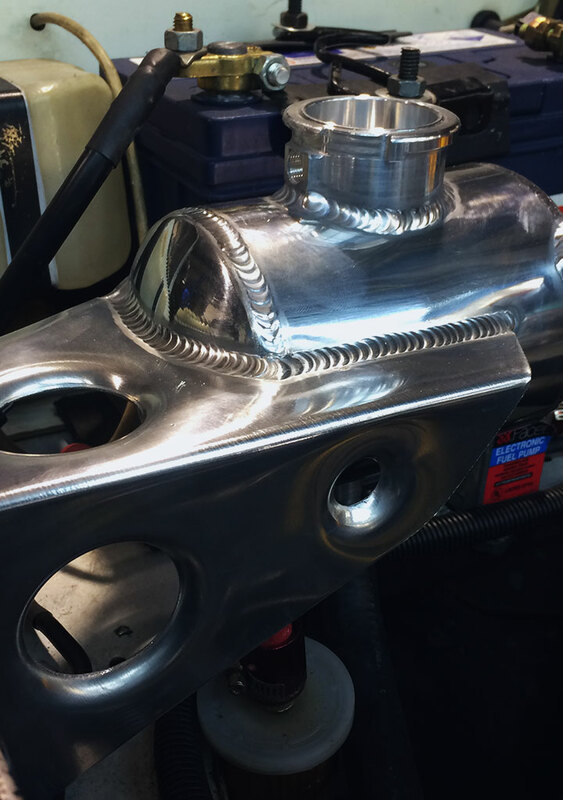 Radiator shrouds can be time-consuming to build, but the results are well-worth the effort. These are usually custom made to complement custom alloy radiators. Most custom alloy radiators and custom brass copper radiators need custom fan packs added. Mounting fans to alloy radiators, especially the “Spal” or “Maradyne” can be challenging. We have a unique mounting process where maximum air flow is achieved to deliver better performance. Fans are firmly mounted yet are easily unbolted for easy access. We would also suggest a weld in thermo fan boss and switch. The predetermined automatic temperature setting is the easiest most trouble free way to control fans. Get in touch with Radiators Plus in Launceston for further information about the custom alloy products we can manufacture for you. Radiators Plus, We live and breath Custom Products.